KLAMATH FALLS, OR--(Marketwire - February 15, 2010) - Golfers who have dreamed of being at THE PLAYERS Championship and taking their shot at the famous 17th island hole at TPC Sawgrass now have the chance to make their dream a reality. JELD-WEN Windows & Doors, a Proud Partner of THE PLAYERS, is hosting a nationwide sweepstakes to win a trip for two to THE PLAYERS in Ponte Vedra Beach, Florida. THE PLAYERS JELD-WEN Golf Sweepstakes is open for entries from Feb. 15 though April 6, 2010, at www.jeld-wen.com/golfsweepstakes. One winner will receive the ultimate golf tournament package, including roundtrip airfare for two, three nights lodging at the beautiful Sawgrass Marriott, meals, ground transportation to and from the hotel, and admission for two adults to THE PLAYERS on May 8 - 9, 2010. The package also includes exclusive hospitality tent passes for the tournament with prime viewing at holes 13, 17 and 9/18. On Monday, May 10, following the tournament, the winner will be treated to a round of 18 holes at the legendary PLAYERS Stadium Course, where Henrik Stenson won last year's PLAYERS and recent champions have included Phil Mickelson, Tiger Woods and Sergio Garcia. "This is the ultimate experience for golf fans, being able to enjoy the excitement of THE PLAYERS and then playing the same course, under the same conditions, the very next day," said Jay Monahan, executive director of THE PLAYERS. "While so much focus is placed on the 17th hole, THE PLAYERS Stadium Course truly is one of the great championship courses in all of golf." For 50 years, JELD-WEN has built its reputation as the world's most reliable manufacturer of windows and doors, offering a full breadth of products that have earned notoriety for dependability, innovation and excellence. The company's long-standing commitment to golf includes serving as the official window, door and millwork provider of the PGA TOUR and THE PLAYERS Championship, which is why JELD-WEN's beautiful custom wood windows and interior doors are right at home in the elegant TPC Sawgrass Clubhouse, home of THE PLAYERS. JELD-WEN also is a Proud Partner of THE PLAYERS and title sponsor of the JELD-WEN Tradition, which together raise hundreds of thousands of dollars for deserving charities every year. For more information about JELD-WEN, or to find a dealer near you, visit www.jeld-wen.com or call 800-877-9482. Follow JELD-WEN golf news on Twitter and Facebook. 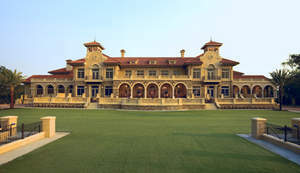 The TPC Sawgrass Clubhouse, home of THE PLAYERS, features JELD-WEN Custom Wood windows and interior doors.